30% scale radio controlled Baby Breitling Wingwalking Team. In August we had a busy weekend at the Woodvale Rally near Southport. 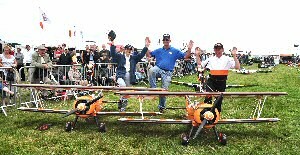 The model airshow is organised by the Liverpool Club and is one of the many attractions at the rally. The Southport Reporter photographed the event and on their site you can see photos of the event, including some silly ones of us. There is also a report and some photos on the RCMF Forum. In previous years there has been time to see the military vehicles, motor bikes, cars and wander round the stands. This year though the team were flying the Breitling Wingwalkers as well as a number of other models so, apart from an hour when we could grab something to eat, one of us was either flying, getting a model ready or waiting in the startup box. It was a busy weekend, but a very enjoyable one. The wind wasn't pleasant again for most of the day and there were a few scratches to the underside of the wings on landing because we had to land crosswind on a tarmac runway. Landing a biplane in a crosswind is always more difficult but a lot of the time it's a fact of life because that's the way the runway is orientated. On the Sunday afternoon the wind calmed down and we had the best flight of the day. Every year the Liverpool Club presents a trophy in memory of Arthur Searl to one of the pilots taking part. Arthur was one of the members of the Liverpool Club and we used to meet him regularly at Woodvale and the LMA events. This year they presented it to the Baby Wingwalker Team which was a lovely surprise. Baby Breitling Wingwalking Team consists of 4 x 30% scale highly detailed Stearman model planes that are radio controlled with fully working wingwalkers. Based on the full size Breitling Wingwalking Display Team.